Hello to everyone that reads this. 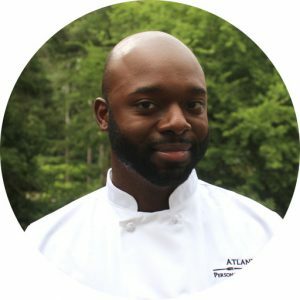 My name is Tai Hart and I am a Personal Chef with Atlanta Personal Chef Service and I just wanted to take a moment to share why I decided to become a personal chef instead of going back into restaurants or catering. My career history has been almost entirely restaurants, catering, working with celebrity chefs and hotels, however sometime ago I wanted a lifestyle change. We all know that the work schedule of catering and restaurants can be and usually is pretty brutal. From seemingly endless prep work to lunch and dinner services that are just draining and often long and late hours; my career was becoming less enjoyable. I had just turned 32 and I was burning out. Also I had just gotten married and the restaurant/catering work schedule isn’t the best when your spouse isn’t in the hospitality field, or some other field that works late hours, every weekend, and must constantly be on-call. I knew I wanted a change that would bring my career-life, home-life, and social-life into a more balanced picture. I even gave thought to changing my career entirely but quickly realized that cooking and nutrition has always made me happy, so why abandon it? It was the arena in which I was working which was the issue. While doing career research I came across a company called Atlanta Personal Chef Service, that peeked my interest. I had a general idea of what a personal chef was and did, however I’d never been one or even met one, so my vision of a personal chef was opaque and I understood that. Honestly, at that point, my idea of a personal chef was a chef who worked for a single family, cooked all their meals, organized and serviced all their dinner parties, had to go with the family on vacation and sometimes lived on the family’s property. This was a naive idea about the job, I know, but to be honest this is what I came up with from what I saw in media. Movies, tv shows, books, social media and so on showed me that to be a personal chef was this image. After contacting Atlanta Personal Chef Service, to learn more about the position I was quickly elated. To be a chef with them is much different than my previous idea. I was going to write what it’s like to be a chef with this company but I think it’s easier to understand if I walk you through a typical day or a schedule, and I’ll do this in the first person. Then I would repeat the process if I have an afternoon client. Now there are obviously more details that come into play including, sometimes, we have dinner parties booked on some days of the weekend and occasionally during the week. That’s a given I think. To summarize, being a personal chef with APCS is a good balance between a chef’s career and a chef’s life. It allows me to be creative, try new things, cook great food for awesome clients, talk with team members who are passionate about food and families being together all while generally getting home from work at a decent hour. That hour is like 6:30pm or 7:00pm for me usually. I’m in a fun, challenging, delicious, intellectually stimulating career with time to spend with my spouse and time to spend on myself…as a CHEF… You can’t find that as a Sous Chef or Executive Chef in restaurant and rarely in catering or other hospitality avenue. That’s why I decided to become and stay a personal chef. Chef Tai is a hard working, caring team member. I enjoy working together collaborating ideas and sharing the evenings experience every chance I get. Have you ever worked with special needs clients, i.e. diabetes and weight loss? My daughter is a Type 1 diabetic and needs desperately to lose weight. Do you have the training to help her plan meals etc? Cost?